We’ve been a camping family since before the boys were born, so putting together a camping themed birthday party has been on my list for a couple years now. And finally, my son about to turn five said yes to a camping themed party! I love to have a themed game or activity for the kids to play at parties. Since we keep our birthday parties “family only,” it’s always exciting for my boys to have a special game to share with their cousins. This year, I partnered up with Wholesome to include their newest treat, Organic DelishFish candies, into my party theme! I mean, what is camping without some fishing, right? Especially when those fish are sweet and fruity (and filled only with the good stuff!). I actually had a lot of ways I worked the DelishFish into our camping birthday party – check out the Gone Fishing Trail Mix and the Fishing Pole Treats in my Camping Party Ideas post (coming soon). But we also used Wholesome’s Organic DelishFish as a party game! And there’s a sweet catch to this game! 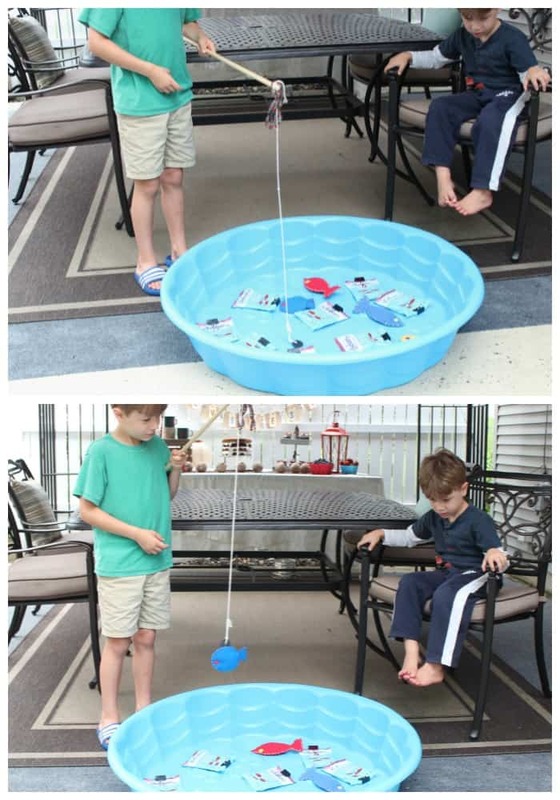 This easy, DIY Gone Fishing Party Game lets kids have fun, and make a sweet catch (one they won’t have to release later!). Create a fishing rod by drilling a hole through one end of the dowel, about an inch from the end. (Alternatively, if you can’t do the drilling, you could hot glue or tape the string down to the end of the rod, or wind and knot it several times). Affix the length of twine/string firmly to the end of the dowel in some way (as mentioned above). Tie the donut magnet to the other end of the string. Adjust the length accordingly – you want the fishing “line” to swing off the ground when little children hold the pole. If it’s too long, kids won’t be able to “swing” it into the pond to catch the fish. You can decorate the fishing pole too – I tied some fabric strips to the end that matched our party decor. Clamp the metal binder clips to the top of each package of Wholesome Organic DelishFish. If you’re using the optional fish cutouts, create those and glue or tape the metal paperclips to the fishes noses. You just need something for the magnet to stick to. 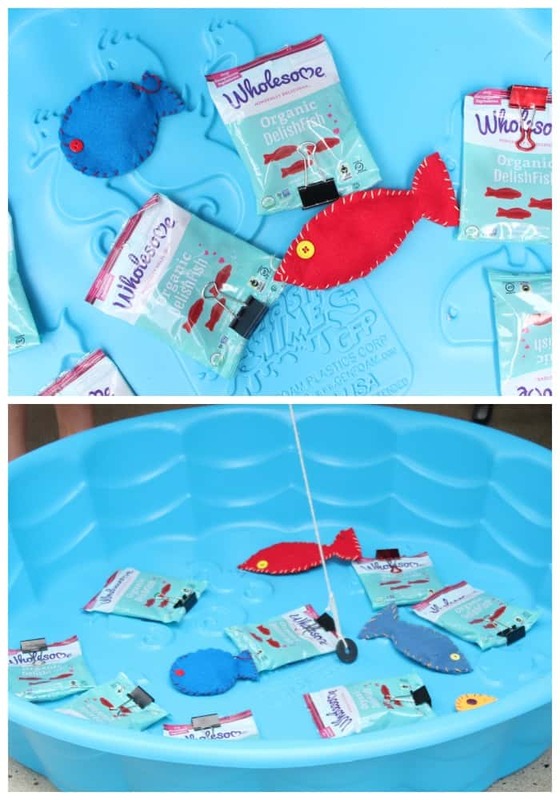 Scatter the DelishFish packages and fish cutouts inside your kiddie pool. Now you have a pond fully stocked with fish! Give each child a turn with the fishing pole to “catch” a package of sweet Wholesome Organic DelishFish! I only created one fishing pole to allow each child their chance to shine at fishing. Also, this helps avoid the possibility of multiple fishing lines becoming entangled, or too many magnets swinging around children’s heads. Tips: Kids may have to lower the magnet into the pond to slow the pendulum effect. Then, like real fishing, they can slowly drag the magnet through the pond, trying to get it to attract to one of the metal binder clips or the paperclips. You need the larger binder clips on the candy packages because they are heavier. Each child only gets one package of fish to take home, but once they have caught their party favor treat, they can continue to fish for the paper or felt fish! Kids will enjoy watching the fun and playing, and can cheer each other on or offer coaching advice to the player for how to land their catch! We like to keep it simple when it comes to party favors. In lieu of a goody bag full of toys that quickly get lost, we have always opted for a tasty treat to take home. Often we give bags of trail mix the kids can mix themselves, or a chocolate covered pretzel rod (both of which I made for the dessert table this year!). A single bag of party-themed candies like Wholesome Organic DelishFish, when paired with an exciting party game, will be a memorable event and a treat combined! The DelishFish are naturally flavored with a light raspberry flavoring, which is… dare I say it? Delish! Parents will thank you for handing out treats that are mindful of what kids consume. Wholesome Organic DelishFish candies are the first candies to be introduced by Wholesome, the leader in Fair Trade and organic sugars and honeys. DelishFish are “mindfully delicious” because they are made with real ingredients you will instantly recognize! They have no high fructose corn syrup (just pure organic cane sugar and organic fruit sugars), and no synthetic colors. And they are made without gelatin, so they’re entirely vegan. Add to this Fair Trade Certified ingredients, gluten free, kosher, and Non-GMO, and I don’t think you can find a better party treat! Wholesome DelishFish are guaranteed to be a treat kids enjoy fishing for AND eating… which is more than I can say for real fishing trips! Ha! What kind of party games and favors do you enjoy handing out at your kid parties!? Thanks to Wholesome for sponsoring this post. Compensation and products were provided in exchange. All opinions are my own.